MMS Magazine Notes Lean Success | KLH Industries Inc. Earlier this year, KLH Industries was approached by Modern Machine Shop Magazine to participate in feature article about lean manufacturing. Editor Peter Zelinski, who visited KLH in April, has published his KLH-inspired article, entitled "The Most Valuable Resource For Succeeding At Lean." 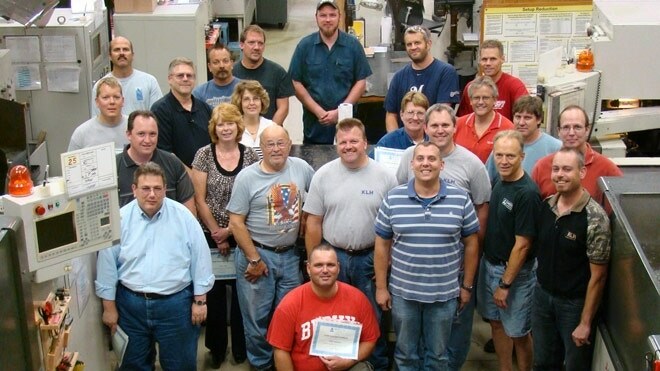 For a culture of lean to take hold at KLH, more of the employees would have to look at the workflow as he had come to see it...Over the course of the past 12 months, groups of employees have attended regular weekly training classes that ran from noon to well into the evening. Today, KLH understands that lean applies to more than just parts and pieces, but to processes and people. The article appeared in the August 2009 issue of Modern Machine Shop Magazine, however, the article is currently available on-line, to coincide with additional lean manufacturing coverage.